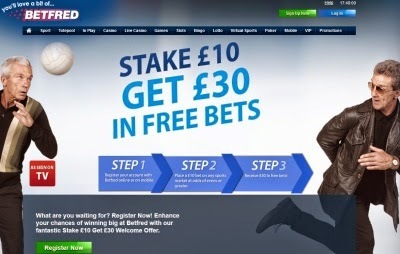 One of the most innovative and rich with bonuses and free bets UK based online bookmakers: Betfred has a generous promotion valid for all new customers from the UK (including Northern Ireland). You need to Stake £10 and you will Get £30. You can open an account from: HERE. To get the free money you need to follow the requirements you will see on Betfred's site: you shouldn't deposit with Moneybookers, Ukash, Neteller or PayPal. Also your qualifying bet should be with coefficient 2,00 or greater.